View our 2018 November General Election Endorsements now! Our phone banks are up and running at the Santa Clara County Republican Party headquarters and we need volunteers to get out the word on ballot measures and help our great candidates! Please view our schedule and signup to volunteer for specific dates at the following link HERE. Just scroll to the dates where you have some free time and choose a time slot. Download Our Official Santa Clara County Republican Party Voter Guide Now! Come join us for our annual 2018 Trunk and Tusk Reception on September 5, 2018. 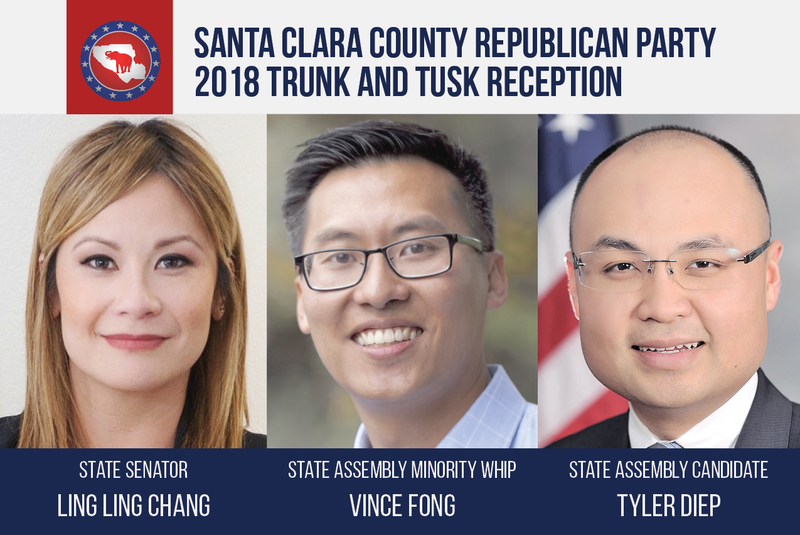 The Santa Clara County Republican Party is honored to host our special guests, State Senator Ling Ling Chang, State Assembly Minority Whip Vince Fong, and State Assembly Candidate Tyler Diep. Learn about Senator Chang’s crucial election which officially eliminated the Democrats’ super-majority in the California Senate. Hear from Minority Whip Fong concerning important legislation that he and fellow Republicans are working on in the State Assembly. Speak with Westminster City Councilman Diep about his campaign for Assembly District 72. Enjoy beverages and appetizers with fellow Republicans. Meet your local elected officials, candidates, central committee members, and party leaders. Our private VIP Reception will begin at 5:00pm for Angel Donors, sponsors, and VIP ticket holders. The General Reception will begin at 6:00pm for all attendees. Don’t miss out on the festivities!